Which glasses frames for female face? Glasses are not only a visual aid, but also a fashionable accessory. So the question naturally arises: which glasses fit my face? Even if every face is unique, there are a few basic rules. How wide should the glasses be? Seen from the front, the glasses should be about as wide as the face, i. e. they should end above the cheekbones to the right and left. The hair does not play a role in this process. But of course there are exceptions: Nickel glasses or glasses with round lenses should be slightly smaller. On the other hand, retro glasses such as butterfly glasses are often much wider. This special shape is not disturbing, but extravagant and fashionable. Some people's eyes are relatively wide apart, others rather close together. 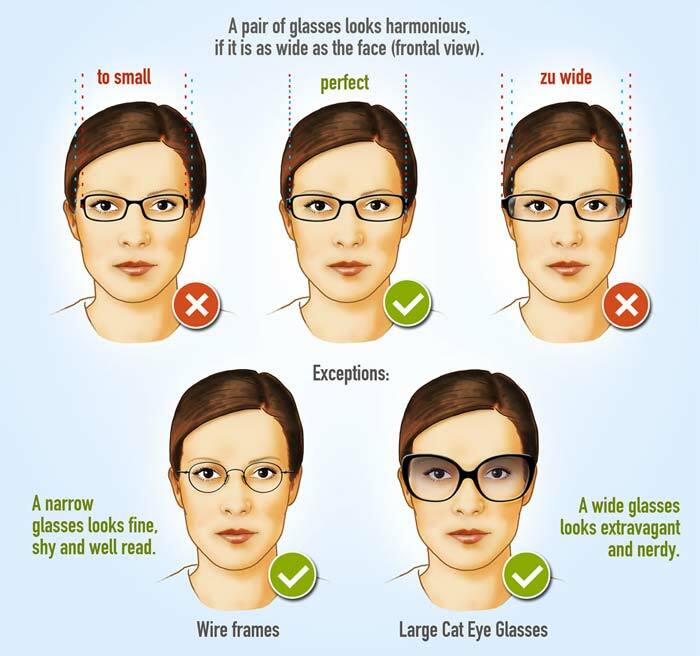 With glasses you can "harmonize"the interpupillary distance. Eye Distance - What glasses frames? In general: the wider the distance between the eyes, the stronger the bridge between the eyes. And the closer the eyes are to each other, the stronger the outer part of the frame and the stronger the temples. Which glasses suit me best? ... are you wondering? Ultimately, it is a question of the shape of the face to determine whether a pair of glasses appears harmonious - or falls out of the frame. 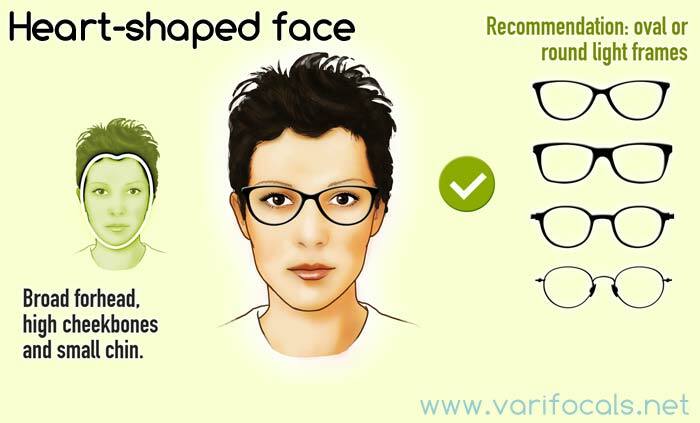 Below are some typical face shapes - and which glasses are suitable for them. An angular face is dominated by relatively hard, angular jawbones. The chin usually has a clear contour and looks angular due to a narrow neck. The cheekbones often sit relatively high. Angular, square face shape - What glasses frames? 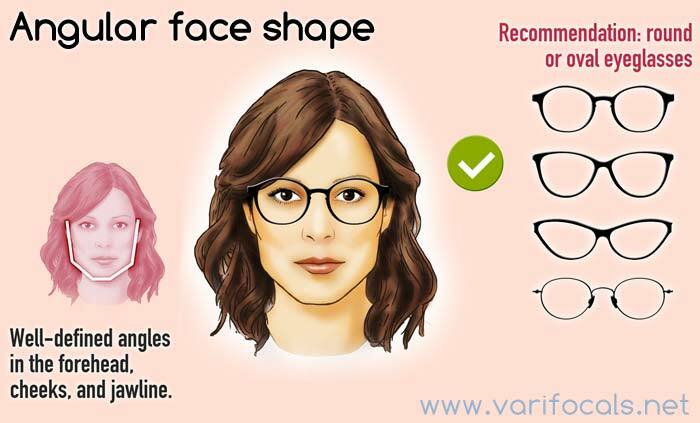 In order to give the hard contours a slightly softer and more feminine appearance, it is advisable to choose glasses with round or curved shapes. The oval face has practically no problems with the choice of glasses. The straight edges and angular shapes make the face look a bit more austere, more definite and modern. Oval face shape - What glasses frames? Round shapes give an oval face even more femininity and a friendly motherliness. In many people, the shape of the face is not elongated and oval, but rather rounded. The round face is characterised by a soft, rounded chin. Round face shape - What glasses frames? The round face tends to appear "too round" with round glasses. 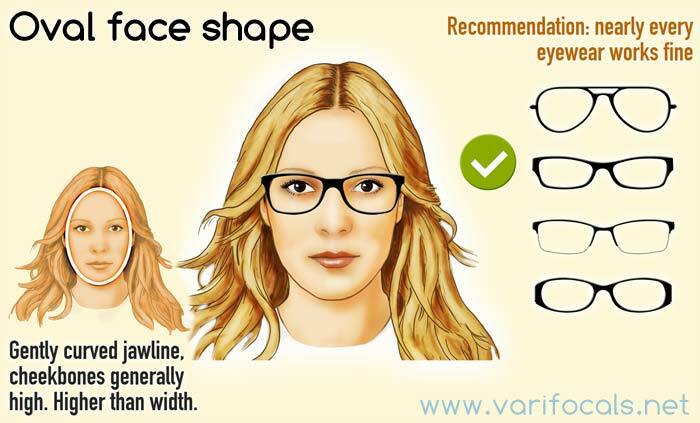 It is therefore a good idea to make the face form appear slightly narrower with glasses that are stretched more wide. A heart-shaped face is a face with a narrow, pointed chin and high cheekbone. Heart-shaped face - What glasses frames? 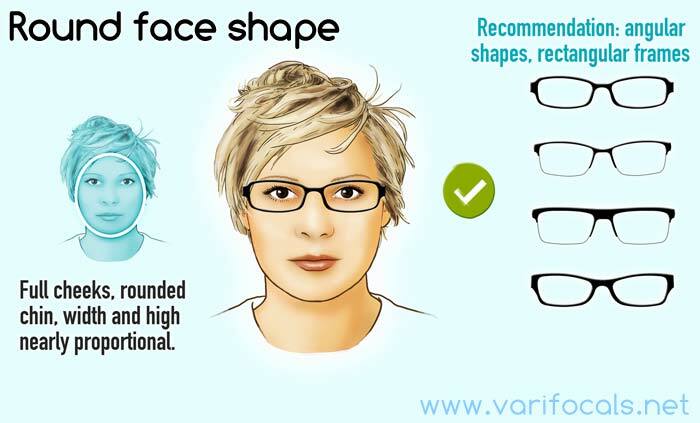 Similar to the square face, it is a good idea to remove the hard edges of the lower part of the face by using a rather soft, curved form of glasses. This makes the face appear friendlier. The trapezoidal face is relatively broad in the jaw area and becomes thinner towards the top. Usually, the cheeks are somewhat thicker and softer. The forehead usually appears quite narrow. 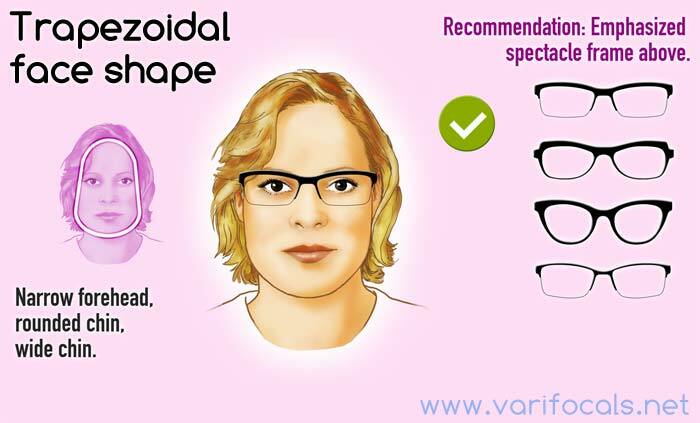 Trapezoidal face shape - What glasses frames? Since the face tends to "slide down", it is advisable to set a horizontal anchor point with the glasses. When the frame is emphasized at the top, the face appears wider at the top and narrower at the bottom. Full rim, half-rimmed or rimless glasses? Full rim frames are heavier than the others. The pressure on the nose and behind the ears can disturb in the long run. 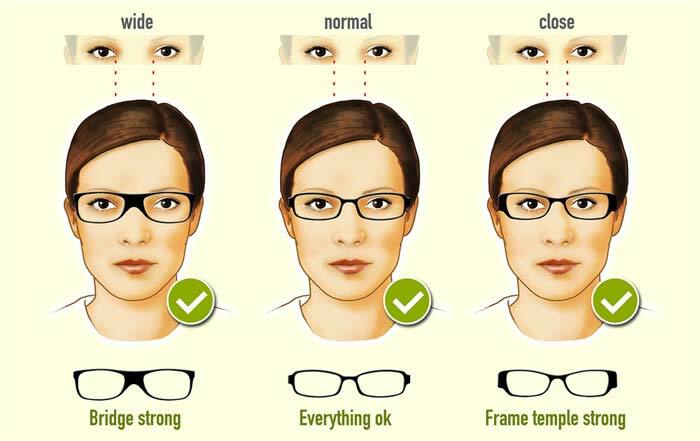 Full rim frames are relatively stable because they completely surround the lens. At the transitions, where the glass sits in a groove of the frame, dust and dirt easily collects, which is relatively difficult to remove. Rimless eyeglasses are very light and inconspicuous. But rimless glasses are also relatively fragile and sensitive. At the nose bridge or the side bars can bend relatively easily. This infographic is licensed unter Creative-Commons-Lizenz CC-BY. Feel free to use and share it - of course it would be nice if you mention this page as the source. Each face has a certain shape. Every form has contours, corners and curves. Choosing the right glasses depends on the basic shape. As a basis for the infographic, I used a "female average face" that was developed in a research project at the University of Regensburg. This face was adapted to each case. Of course, no one has an average face. Of course individual is better. If you don't find yourself in one of the five cases: it doesn't matter. Familiarize yourself with the guidelines. For soft, round faces straight edges act harmoniously and give more firmness and dynamics. For angular, bony faces the situation is the oppisite: soft, rounded shapes gives more feminine harmony. If you want to see some nice female eyeglass frames, you can find some nice ones here at Brillen-Sehhilfen.de under women's eyewear (german). How to find the right glasses for womans face?